I am LITA BURKE, an indie fantasy author. As an avid reader, I enjoy downloading titles by new authors onto my Kindle and reading during my commute on the train. I work a day job and write my fantasy stories early in the morning before the day clutters up my brain. “Wrath” is a fantasy short story about retired Enchanter Tredan’s desperate fight with a superior magician who will stop at nothing to acquire Tredan’s dangerous spell book. I wrote Wrath after drafting the main story in Tredan’s Bane. It shows us why Tredan sends a ghost to warn his wife Lanith not to come home, and we learn the surprising cause of the fire that steals everything the couple owns. I hope you enjoy Wrath. Just like Tredan, after you enter his world, be ready to RUN. 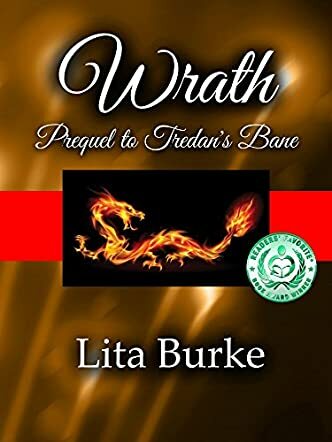 Wrath, Prequel to Tredan's Bane is a fantasy short story written by Lita Burke. Tredan is a former Enchanter who runs a magical charms shop with his wife, Lanith. He has just received a new supply of charms, along with a warning from the Merchants' Guild that one charm reeks of Church magical essence, something that, as a Magic and Merchant guild member, Tredan can't sell. As Tredan unwraps what he believes to be a Pleasure Charm, he's dismayed to find an Enforcer's Compulsion Charm in his hands. Its message is dire: give up the forbidden journal Tredan wrote when he was an Enchanter. Tredan knows a visit from the Enforcer is due any minute now and feverishly tries to figure out a way to warn his wife of their problem and tell her not to return to the shop. His Divine had enspelled Tredan to forbid him revealing anything about that journal, so Lanith is unaware of its existence and of the danger they are in. Lita Burke's short story is a beautifully crafted and exciting magical fantasy. I was amazed by how quickly I was drawn into the story. Burke brings a magical world to life with a deft and economic use of words and imagery that is really quite remarkable. It felt like I was watching Tredan carefully unwrapping the charms and fighting for his life against the Enforcer. Wrath, Prequel to Tredan's Bane, is an excellent stand-alone short story, but it has cast quite a spell on this reader, and I'm planning on reading Tredan's Bane to find out what happens next.